Exciting things are afoot in the Insects as Food arena, especially in Europe! As you may recall from our previous article on this topic, the topic of including insects in people’s diets has been a big discussion in Europe. While more that 2 billion people worldwide already include insects in their daily diet, both the United States and Europe have concerns when it comes to allowing the use of insects as food. As we all know, there are many amazing benefits to eating insects, including comparable protein by weight to more popular options such as turkey and fish. This, along with the fact that farming insects also takes a lot less feed and water, means this option can no longer be ignored! So what are the different countries of the world doing about it? In February 2015, Switzerland was planning to approve some of the same insects as Belgium has been allowing. 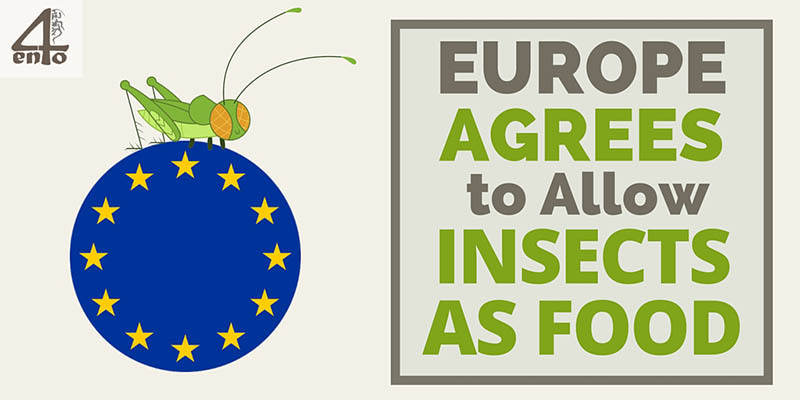 However, According to the ESFA, Switzerland has not preformed a risk assessment on insects as food as of October 2015. The plan is to allow insects as food in 2016, and as far as we know that is still on track. What is the USA Allowing? In the United States, the topic of insects has not been discussed as largely and the control of insects as food has slipped through the cracks of the FDA. The FDA allows for percentage of insect fragments in food because they are an unavoidable defect. Yet, insects themselves, do not fall into a specific category. The FDA then considers these food defects. So, while there may be questions on the safety of eating bugs, people are already eating them without even knowing it. According to an interview with Tiny Farm, there is a law that meat, poultry and eggs must be inspected by the USDA, however, insects do not fall into any of those categories either . There are also no specific regulations about how to raise insects as food, so instead, the farmers must use common sense and it make their own measure of quality. There are many other concerns in the United States about the lack of control over insects as food including the minimal information on allergies. Gathering all of the information on allergen match-ups for insects and other foods and all potential allergens will take a lot of work and time. In Europe, it had also been unclear which category insects fall under. Throughout 2015, it was being heavily debated whether they were Novel Foods or regular foods. And luckily, we have also had some very supportive organizations such as IPIFF, helping producers in this area. Finally, on October 28 2015, a new Novel Food Regulation was voted on. As a result, Novel Foods were re-defined more clearly and in great depth and clearly. 10. food used exclusively in food supplements within the Union before 15 May 1997, where it is intended for use other than in food supplements. Check out this Q&A for more information. And since then, many new foods has been developed and questioned, updating these regulations became a necessity for the EU according to the Euro Parl website. Potential Exemptions For Existing Insect Products? While any new foods will be subject to the Novel Foods laws as mentioned earlier, there is a light at the end of the tunnel for existing foods on the market. And on top of this, it has to be considered how long the product has been on the market already. If it has been successfully sold, with no health issues, then such a product may obtain an exemption from the EU. The above statements still seem somewhat unsure, so please do your own due diligence with the appropriate authorities. Need Authorization For Your Novel Food? I know many of you are wondering how to get authorization and what the requirements are exactly. So here is the European Commissions own page on the subject that you should definitely read in detail. The ESFA was asked to preform a risk assessment on insects as food on October 8th and found there was no additional risk of eating insects fed on substrates or non-human and non-ruminant origin compared to the use of any other food. This means as long as the substrate and farming environment used follows certain guidelines, there would be no risk to people eating those insects. However, the risk posed by insects fed on other substrates should be specifically tested and studied further. While the safety concerns are still being assessed the EFSA does not have any immediate safety concerns. Next on the voting board are new rules to allow a safety evaluation and authorization of Novel Foods at the EU level. If there was a safety risk found in the inspection, the EFSA would carry out a further assessment. Not only will these new rules need to be approved by Parliament, they will also have to be approved by the Council of Ministers. If there is no approval as expected, the two institutions will have to go into negotiation. The new Novel Foods regulations are expected to be put into place, assuming that they are agreed upon, by January 1st, 2016. The rules and regulations regarding insects as food are always changing, and, are different in every country. So if you know of some changes or rules that we are not aware of please feel free to get in touch.